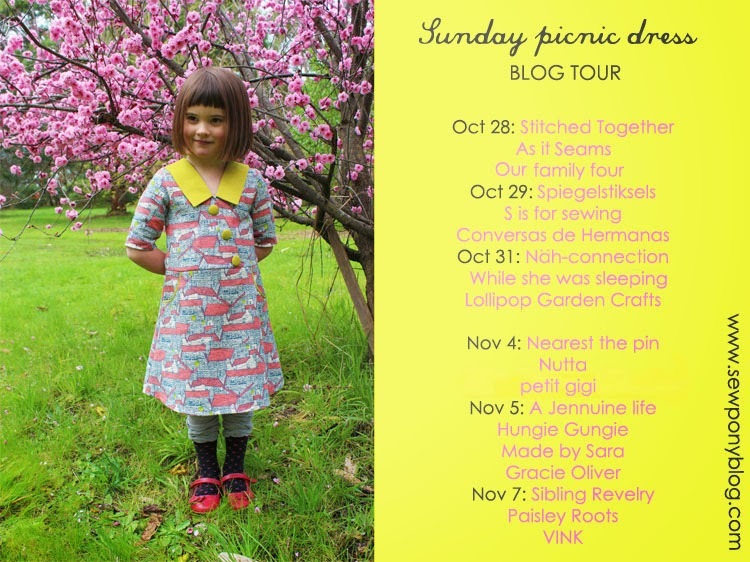 For the second day of my Sunday picnic dress blog tour I have another three talented seamstresses showing you their dresses. Throughout the tour, you can receive a 15% discount on your purchase of my new pattern with the code: SUNDAYTOUR15. You can purchase through my shop or through etsy (Aussie buyers can buy by direct deposit via etsy if you do not have a paypal account). A full description of the dress and some more more photos are on my shop listing. Nele from Spiegelstiksels, Ana Sofia from S is for sewing and Rita from Conversas de Hermanas are sharing their dresses today. Nele blogs from Belgium at Spiegelstiksels. She makes beautiful and fun clothing for her children and won the most recent season of Project Run & Play. All of her outfits were outstanding and also very different. I think my favourite was my this one - an origami denim jumpsuit and jacket. So cool! I am very happy to have Nele on my tour and she altered the skirt of my pattern to include a big pleat. Go to spiegelstiksels to see Nele's stunning dress! Ana Sofia blogs from Portugal at S is for Sewing. Her sewing is classical, neat and oh so pretty. Ana Sofia has been a blogging friend of mine for over a year now and she has sewn up two of my patterns already and helped me with testing my Sunday picnic dress. I love her hopscotch skirt she made during Kids' Clothes Week. Head over to see Ana Sofia' lovely dress here. Rita blogs from Conversas de Hermanas with her sister Fatima. I am a new follower of Rita and Fatima's blog and Rita tested my Sunday picnic dress and made two gorgeous versions. Thank you Rita!! 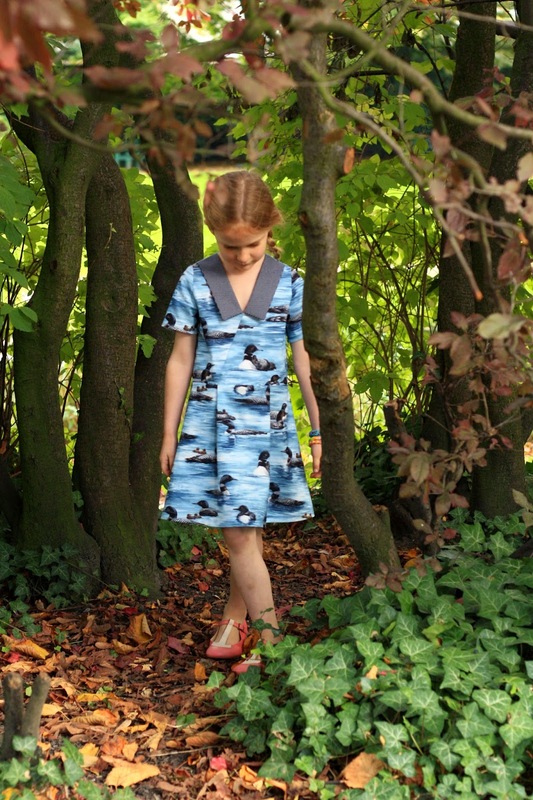 She is sharing the second dress she made today which looks gorgeous on her little niece! 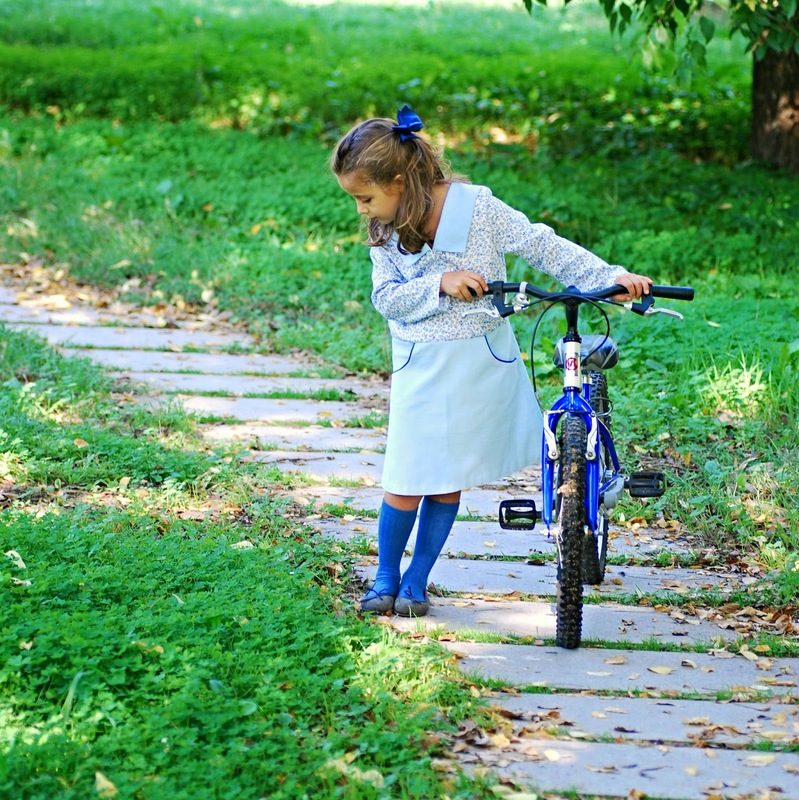 To see Rita's lovely dress, head over to her blog. Thank you so much Nele, Ana Sofia and Rita!! Thank you Suz! I really enjoedy making this dress and plan do to a lot more... The pattern, as usual, is very good!!! Thank you Rita:)Can't wAIT to see yours Erin!! Congratulations on another gorgeous pattern, Suz!